Has a film ever sparked your wanderlust? 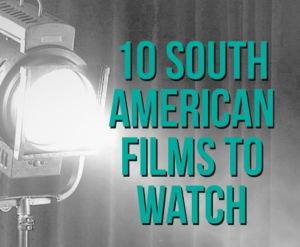 Film-making can be a fantastic window into different cultures and here are 10 of our favourite South American films to watch. The raw but touching story of a cynical former schoolteacher who is left to care for a homeless young boy in search of his father. With more intrigue and twists and turns than your regular road trip, director Walter Sales capture the harsh realities of life in Rio de Janeiro with finesse and combines it with some superb cinematography to create a movie you will long remember. In this fast-paced, clever romp of a film, con-man Marcos (Ricardo Darín) teams up with small-time swindler Juan (Gastón Pauls) for a once-in-a-lifetime opportunity. In less than 24 hours, they must sell a forged sheet of highly valuable ‘9 Queens’ stamps to a Spanish collector before he leaves Buenos Aires. As they con and are conned, director Fabián Bielinsky draws you into a deepening puzzle and keeps you guessing until the final reveal. A slick and brilliantly crafted film, the film is smooth and uncompromising in its portrayal of conman deception. The winner of 21 international film awards, Nine Queens was feted as a true rival to the legendary con-films of David Mamet. Based on the memoirs of Ernesto Che Guevara, this captivating biopic follows the youthful Ernesto (Gael García Bernal) and his best friend Alberto (Rodrigo De La Serna) on their epic journey of transformation. Determined to discover their continent, the two students embark on a four month-long motorcycle trip throughout South America. Full of romance and energy, their adventure takes on a deeper meaning as they discover a South America racked by injustice and inequality. It is this journey that gave birth to Che’s dreams of a peaceful social revolution. Academy Award-winning director Walter Salles creates the ultimate road-movie; joyful and thought-provoking, set against the breathtaking South American landscape. It reveals the man of youthful hope behind the iconic Che, and his awakening that would shake the world. Winner of a host of International awards, including at the Cannes Film Festival, the Academy Awards and the BAFTAs, this is a film to watch and remember. In the lawless slums of 1960s Rio de Janeiro, violence and drugs reign supreme. The film is told through the eyes of Rocket (Alexandre Rodrigues), who uses his camera as an honest mirror to a dishonest world. As a brutal war over drugs and power darkens the neighbourhood, Rocket risks his life to expose the city’s corruption and violence, and chronicles the fall of its notorious crime lord. Based on a true story, Fernando Meireilles’ energetic film is a true masterpiece. Received to critical acclaim around the world, it was nominated for four Academy Awards and won 19 prestigious international film prizes. Good-natured Coco (Juan Villegas) is down on his luck. A gas attendant for twenty years, he finds himself suddenly unemployed, and at 52 years old – unemployable. He helps a woman whose car has broken down, and she gives him a pedigree Argentine Dogo in return. A large and savage-looking dog, Bombón is in fact gentle and obliging. The quiet duo find themselves forced on an extended road-trip, and with Bombón, Coco’s luck changes. Winner of an International Federation of Film Critics prize, the real focus of this tender, elegant film is the achievement of quiet dignity through friendship. A school priest at a prestigious college in Santiago, inspired by the leftist views of then-Chilean president Salvador Allende, creates a scholarship program for five proletariat kids. One is slum-raised, Indigenous Pedro (Ariel Mataluna), who forges an unlikely friendship with white, rich kid Gonzalo (Matías Quer) in a time of deep social division. Their friendship is challenged by Chile’s violent political upheaval, and the eventual 1973 bloody military coup of General Augusto Pinochet. Director Andrés Wood powerfully illustrates the effects of lost democracy on society’s most innocent members. Winner of the 2004 Vancouver Film Festival’s ‘Most Popular International Film’, Machuca portrays the simplicity of childish innocence, and the painful complexities of its impotence. Roberto (Ricardo Darín) is the antisocial owner of a small hardware store, whose life revolves around his singular quest for meticulous order. All this is upended when a young Chinese man, Jun (Ignacio Huang) is forcibly thrown out of a taxi in front of him. Jun has no money, no Spanish and the address written on his arm is a dead-end. Grudgingly, Roberto lets Jun stay with him and help out at the store, raising eyebrows around the town and throwing his hermit-like existence into charming chaos. Chinese Takeaway’s genuine warmth and wry, laugh-out-loud comedy made it Argentina’s highest-grossing, non-US film in 2011. Sebastián Silva’s enthralling film manages to combine drama, comedy and psychological thriller. It centres on a Spanish family, energetically and loyally served by its maid Raquel (Catalina Saavedra) for over 20 years. When Raquel starts to suffer dizzy spells, caused by over-exposure to chlorine, her employer Pilar hires additional maids to help her. Feeling usurped, territorial Raquel turns on the maids in a sustained and vicious attack. Saavedra’s nuanced portrayal of the fierce, yet vulnerable, uniformed maid is reason enough to see the film. Premiering at the Sundance Film Festival, it won Best Actress and Best Film in World Drama, and then went on to win 11 other prestigious film awards around the world. The film opens with Rafael (Ricardo Darín), a middle-aged restauranteur, on the edge of a mid-life crisis. His phone constantly rings with a new emergency, he feels guilty about not spending enough time with his daughter or mother Norma, who suffers from Alzheimers, and he is avoiding making a commitment to his girlfriend. He suffers a minor heart attack, which forces him to reconsider his life. Rafael’s father is determined to renew wedding vows with Norma, to give her the proper church ceremony he couldn’t afford when they were young. Rafael joins his father on this surprisingly difficult quest; creating charming family bonds and Rafael’s crucial transformation. A film that celebrates life’s important relationships, it won the Silver Condor for Best Film and was nominated for an Academy Award. Boutique South America will be partnering with Palace Cinemas to screen the first Cine Latino Film Festival where you can discover the sights and sounds of this marvellous continent at theatres nationally in August. Visit festival website here. Ever been curious about traveling to South America? Find your perfect place in South America with our interactive quiz.